Global SPECT market is expected to witness upsurge in its revenue owing to extensive research in development of diagnostic and therapeutic treatment. 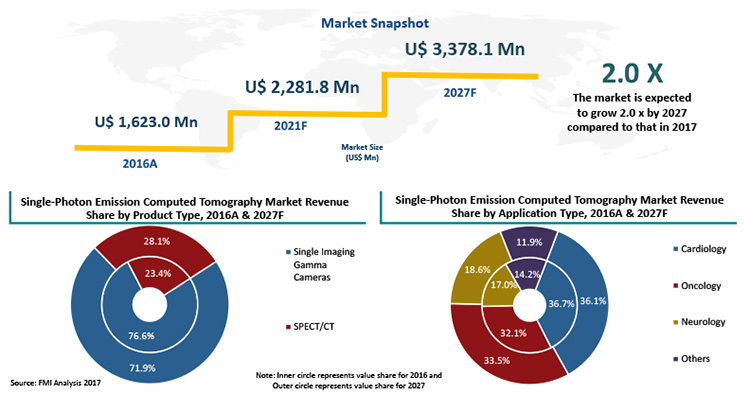 • Global Single-Photon Emission Computed Tomography Market revenue is expected to increase at a CAGR of 6.9% during the forecast period (2017–2027). • By product type, single imaging gamma cameras market dominated the global SPECT market in 2016, and is expected to continue to do so. • North America Single-Photon Emission Computed Tomography Market accounted for largest revenue share of 40.5% in 2016. 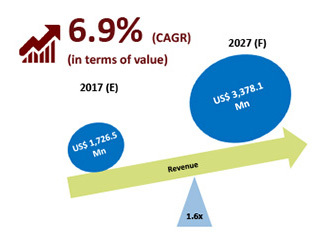 • Asia Pacific excluding Japan is expected to experience highest CAGR of 8.9% over 2017–2027, primarily due to growing incidence of chronic disorders and rise in aging population. • Beijing Hamamatsu Photon Techniques INC.
• SHENZHEN BASDA MEDICAL APPARATUS CO., LTD.
Single-Photon Emission Computed Tomography Market is fragmented with very few major players operating globally. North America represents the most lucrative market for Single-Photon Emission Computed Tomography, followed by Western Europe and APEJ. 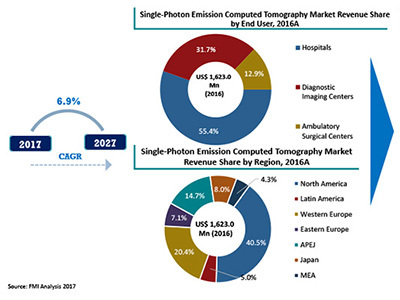 Although hospital End User segment dominated the global market in 2016, diagnostic imaging centers segment is expected to be the fastest growing end use segment, primarily due to adoption of Single-Photon Emission Computed Tomography. Key Differentiating Strategy: Companies are focusing on driving growth in mature markets so as to maximize growth prospects.